January Harris is fully employed but relies on Section 8 housing vouchers to live in a sub-standard apartment. January Harris meets all the “personal responsibility requirements” the Trump administration and Housing and Urban Development Secretary Ben Carson say boost people out of poverty and government-assisted housing. She’s employed full-time as a receptionist at a local nonprofit corporation. Harris has a long work history in home health care and is a certified phlebotomist. She continued working through multiple moves around greater St. Louis— even through personal tragedy when a gunman shot and killed her eldest daughter four years ago. But Harris struggles to pay her bills despite nine-hour work days and an hourly wage of $10.65. Her limited income pushes her into debt most months. She asks relatives for a few extra dollars to get by and support her 12-year-old daughter, Janelle. Harris, 38, and her daughter now live in a two-bedroom townhouse in Ferguson, courtesy of HUD’s housing choice voucher program, commonly known as Section 8, a subsidy system that permits a person to locate and live in privately owned and operated property. Harris’ circumstances mirror those of poor Americans in hundreds of cities and towns across the nation — those who live perhaps only one missed payday away from personal economic disaster. Harris’ household is among 2.2 million others nationwide that, according to data from the Center on Budget and Policy Priorities, use government vouchers to pay for their housing. The neighborhood isn’t safe,and neither is Harris’ home. A week after her move into the townhouse in 2014, a white police officer shot and killed black teenager Michael Brown a two-minute drive away. 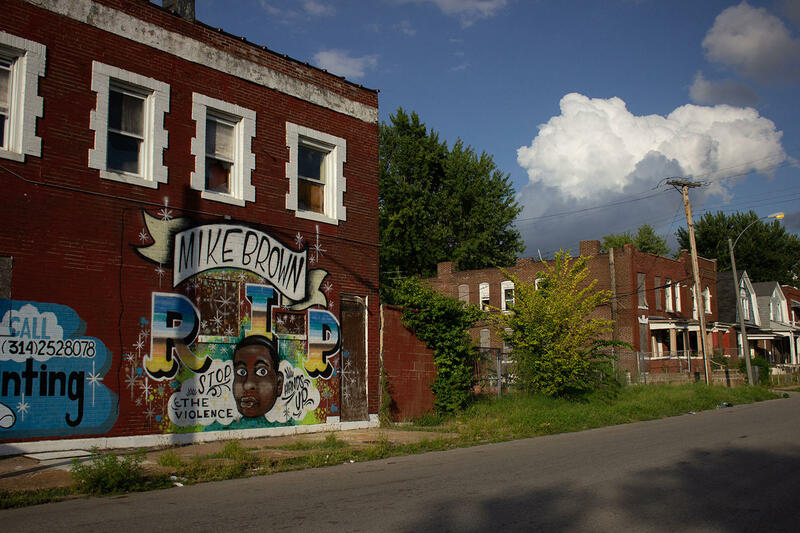 Mural of slain teenager Michael Brown in the north St. Louis. Protests roared around her, often trapping her indoors. While stuck, she realized mold was growing through her ceiling and in her basement. Her building management, she said, just painted over it. She unsuccessfully tried to arrange a move back to her previous public housing complex and sought help from nonprofits, looking for a way out. Harris moved from the center of the complex to another unit, paying fees she couldn’t afford and taking on a higher rent that left her more destitute than ever. To her, it feels unfair. Her job and townhouse were supposed to be stepping stones to a better life. “I might as well have had another baby or not have a job at all,” she said. Section 8 and public housing are two core programs under HUD. But President Donald Trump and Carson have targeted those programs for cuts — the result of their crusade for the nation’s lowest-income Americans to become more self-sufficient. “We know the single best anti-poverty program is a very simple and very beautiful paycheck,” Trump said in January while speaking at the World Economic Forum in Davos, Switzerland. Public housing programs are already rife with problems. St. Louis is a prime example. The city’s housing authority is facing a lawsuit from state Attorney General Josh Hawley — a Republican running for the U.S. Senate — over the lack of remedial action for “intolerable conditions” at the Clinton-Peabody public housing complex. Meanwhile, low-income residents in the St. Louis area spend months on waiting lists for public housing units and years waiting for Section 8 vouchers they then, like Harris, must scramble to use. The disconnect between poor people’s housing realities and the Trump administration’s vision for them comes as Democrats find themselves pursuing the 2018 midterm votes of black Americans disenchanted with Trump administration policies. In Missouri, incumbent Democratic Sen. Claire McCaskill, who’s particularly vulnerable to Hawley’s challenge, needs every African-American vote she can get. African Americans in the city and the county of St. Louis, on average, comprise nearly 94 percent of Section 8 housing choice voucher holders and those living in public housing, according to HUD data. But disillusioned voters such as Harris could just stay home if they don’t feel an incentive to cast a ballot. 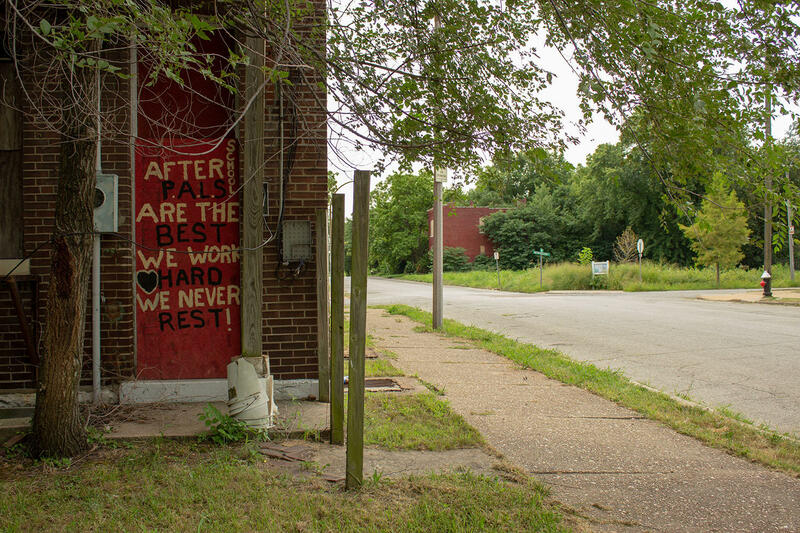 In the city of St. Louis, years of racially coded housing policies forced many black families to live in some of the city’s oldest, most rundown housing stock. The policies also blocked black families from homeownership and, during the mid-1900s, dislocated many black communities. This prompted the federal government to offer some people public housing (federally funded units managed by housing authorities) in high-rise buildings. The most notorious was Pruitt-Igoe, 33 buildings of high-rise style apartments built in the 1950s and completely demolished in 1976 because of increased crime, vacancies and poor living conditions. What remains in the immediate vicinity are three city schools on the northside, which has large swaths of blight, and crumbled grounds that will soon be turned into a National Geospatial-Intelligence Agency,part of the Department of Defense. Rep. William Lacy Clay Jr., D-Mo., hopes the campus will bring jobs and development to the area. 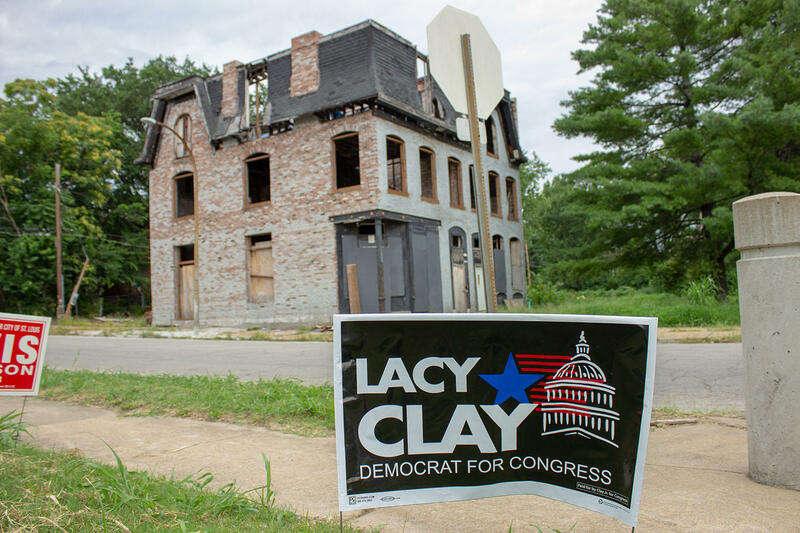 Signs supporting Lacy Clay in the Hyde Park neighborhood. 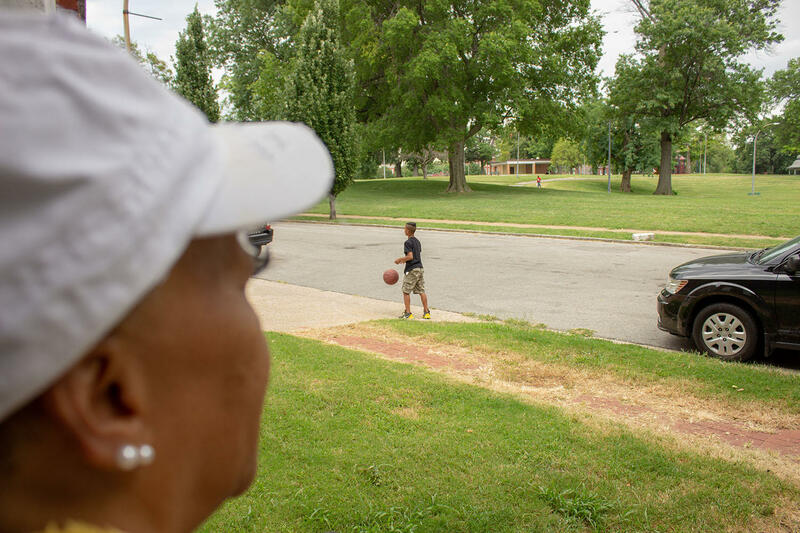 Cheryl Lovell, executive director of the St. Louis Housing Authority, who’s retiring this month, said the number of “traditional public housing units,” like Pruitt-Igoe, have decreased since she came aboard, and the Section 8 voucher system makes up for some of that loss. But the number of people of who need housing has risen over time, she said. An average of 10,000 public housing units are lost each year because of demolitions or dispositions, and $26 billion in repairs is needed for current stock, according to HUD. The National Low Income Housing Coalition estimates that the backlog of capital needs is more than $40 billion.The odds that either billion dollar figure needed to repair or revitalize them will be appropriated are low, leaving the 1.1 million units with little options to make improvements. Harris, in stark contrast to residents of Clinton-Peabody, lived in public housing when she resided in LaSalle Park, a 148-unit property in the southern half of the city that’s received positive assessment scores from HUD. But she said she enjoyed living in public housing much more than she does her current Section 8 location — she found the application process and requirements for public housing to be easier for low-income families. Harris waited years before her name was pulled from the Section 8 waiting list in May 2014. By the time she received her acceptance letter in the mail, she only had two months to find a home for her and Janelle before the Section 8 voucher would expire. LaSalle Park, unlike older versions of public housing, is a community of townhomes. HUD and its housing authorities throughout the country are moving away from the high-rise apartment buildings, Lovell said. About $50 million of the $78 million operating budget St. Louis Housing Authority received from HUD is for direct payment to landlords for Section 8 voucher participants and more than $14 million goes toward operating subsidies for public housing units, she said. The money that Congress appropriates is never enough, causing the authority to dip into its reserves each year, she said. If Congress would fund programs at 100 percent, it would be helpful for agencies like hers who are held responsible for conditions in which their residents live. The St. Louis Housing Authority, a top performing agency by HUD’s standards, is currently under intense scrutiny after residents of Clinton-Peabody housing complex complained to the local HUD office about pests. In December, the health department reported 165 units out of 343 inspected units showed signs of mice. The health department reported six units showing signs of mice and eight units showing signs of roaches as of August, Lovell said. The problems at Clinton-Peabody have escalated this year, and McCaskill in particular has been out front with some election-year intervention. In March, she requested that HUD act swiftly with a plan to get rid of the rodent infestation and to share that plan with her. She visited residents in April to follow up on conditions. Hawley, the state’s attorney general, took matters even further by filing a lawsuit in August against the agency and its management agent, McCormack Baron Management. Cady Seabaugh, vice president of communications and sustainability for McCormack Baron, said it’s company policy to not comment on pending legislation. Lovell said the housing authority became aware of Hawley’s investigation about Clinton-Peabody in April when they received a demand for documents. She said the housing authority provided more than 1,000 pages in response to his request by the deadline given and offered to provide more information if needed. “As St. Louis Housing Authority has been fully cooperative, we are disappointed that the Attorney General chose to file suit without any communication about the issues involved,” she said. The attorney general’s office still saw it “necessary to file the lawsuit” after receiving the documents and conducting an investigation of facts “to protect the health and safety of the residents of Clinton-Peabody Housing Complex,” Mary Compton, communications director for the Missouri attorney general’s office, said in a statement. The lawsuit is trying to right the wrongs for tenants by seeking restitution for the time in which tenants paid rent while living in substandard housing. The St. Louis Housing Authority has spent approximately $336,000 on corrective actions that range from blocking drainage holes in dumpsters and plugging holes where mice activity was identified. Even with all the attention, Clinton-Peabody residents are still living in less-than-desirable conditions. Factory worker Ebony Williams, 34, said she would often see mice around her floors and in her kitchen where mice droppings were so rife in her stove that it made it unusable, causing her to travel to her mother’s home to cook for her and her daughter. She waited months before she would receive a new range from the complex. While the mice are mostly gone now, it seems like roaches are taking over, she said. Williams is hoping to find a way out of the complex, but is finding it difficult to find the help she needs to begin the process. Clay, whose district covers all of the city of St. Louis and a part of the county, did not respond to numerous requests for comment about the Clinton-Peabody complex and St. Louis housing issues, in general. He is a member of the housing and insurance subcommittee that oversees HUD and other agencies and is all but assured to win re-election in November. Renters account for 46 percent of all households in Clay’s district compared to 34 percent in the state, according to the National Low Income Housing Coalition. Some of the city’s poorest residents say the city is failing them. Consider that for every 100 of the poorest families in Clay’s district, there are only 29 affordable units available, according to data from the National Low Income Housing Coalition. Seventy-five percent of extremely low-income households in his district are spending more than half of their income on rent. Those figures are among the worst in the state. In St. Louis County, 22,753 people are part of the Section 8 voucher system, where the average household income per year among Section 8 voucher holders is $13,482, according to HUD data. Susan Rollins, executive director of the Housing Authority of St. Louis County, said there have been some people waiting to be Section 8 voucher recipients for as long as 10 years, leaving many families either homeless or in shelters. The Housing Authority of St. Louis County last opened its Section 8 voucher system in 2015, when 13,000 people applied. There are now 3,500 names left on the list, according to Rollins. Chances of getting in the Section 8 voucher system in the city are also slim. The last time it opened was July 2014, when it received 27,852 applications for vouchers in one week. Lovell said there are still almost 21,000 names on the list, which “won’t be open for a while,” she said. For public housing in the city, there are waiting lists with 13,000 to 14,000 people, but they do open up periodically. She suspects waiting families are either living with family members, residing in substandard apartments or experiencing periodic homelessness. Part of what ails the housing authorities and many others like them across the country is the lack of money and resources. In February, Trump’s Office of Management and Budget wanted to cut the HUD budget by $8.8 billion, to $39.2 billion. Congress instead granted $52.7 billion to the agency, with a large amount of the money going toward Section 8 programs and public housing. The White House did not respond to the Center for Public Integrity’s requests for comment. Sarah Mickelson, senior director of public policy for the National Low Income Housing Coalition, said the 10 percent increase in funding was a step in the right direction as the number of public housing units continues to decline as does the condition of the properties. Section 8 voucher funding always receives a slight increase to keep up with inflation, but the allotted spending mostly maintains the status quo. The lack of funding for low-income housing has always been a problem, Mickelson said. She said before Trump entered office, about one in four households eligible for housing assistance were able to receive it. “This administration brings new threats,” she said in reference to Trump’s past budget proposals that would have severely cut funding to housing programs, nearly decimating them. Carson sent housing advocates down another spiral in August when he announced plans to “streamline and enhance” an Obama-era rule known as Affirmatively Furthering Fair Housing that required communities receiving HUD funding to make an effort to integrate their neighborhoods or deal with lower federal support. The 2015 rule that was passed to enhance the Fair Housing Act “proved ineffective, highly prescriptive, and effectively discouraged the production of affordable housing,” according to HUD. Experts like Deborah Thrope, supervising attorney for the National Housing Law Project, have concerns that rolling back the rule would cause further segregation in communities already divided along color lines. Another Carson effort using the private market to preserve current public housing stock and to produce more housing choices is the five-year-old Rental Assistance Demonstration (RAD) program. Through contracts made with the housing authorities, public housing is converted to project-based Section 8 units. One of the appealing aspects of the program is that it gives housing authorities a chance to dip into a pool of resources for needed maintenance without depending on Congress. The program erases the 46 years it would’ve taken to address needed repairs, according to HUD. In September, Carson said 100,000 units of affordable public housing have been preserved through the program. Lovell and Rollins question how the financing of the program would work as neither agency has converted units through the program yet. Thrope also questions the long-term affordability of RAD properties and its link to the low income housing tax credit, which she said is essential to the program. But that’s not the majority of RAD transitions, said Tom Davis, director of the Office of Recapitalization at HUD. Davis said about four in 10 RAD transitions used tax credits, and larger-scale construction tended to correlate with the use of credits. The rest typically have large, upfront investments or they set aside money over time for repairs. Housing authorities must prove they have enough money to handle aging real estate in the future, and they have to pass a capital needs assessment before they convert a property. When it comes to addressing how long the program will be around, he said the administration has proposed eliminating the cap imposed on the number of housing authority units that can participate. RAD arguably offers some of the strongest tenant protections, which include prevention of displacing residents in public housing undergoing conversion and the option for residents who return to transitioned buildings to receive a Section 8 voucher after a certain amount of time. But the protections aren’t always enforced, and there have been problems with disabled individuals having a home once a property has been converted, according to experts. Davis recognizes that RAD, like any other program, isn’t perfect, but it is offering a path for housing authorities to address their capital needs problems. “It's important to remember that RAD is a preservation program and by converting under RAD and securing the long-term future of these properties, that’s a huge win,” he said. HUD is also trying to figure out how to create more housing options for Section 8 vouchers — such as the ones Harris uses — based on a recent pilot study with Urban Institute. The study indicated that landlords in five study sites routinely try not to rent to Section 8 voucher holders and treat them differently during apartment showings. Lucinda Frazier, vice chair of the St. Louis City Democratic Committee, said she would like for HUD and other entities to send more money to St. Louis to build more affordable homes and rehab the decaying buildings throughout the city, particularly on the north side. One of many abandoned homes in Hyde Park. Frazier said many homes need to be torn down but the ones that can be saved could be given to people willing to revamp them — if they had the money. “So we have big beautiful homes in the city of St. Louis, and they're just standing there,” she said. While Clay’s re-election is almost certain, McCaskill’s is not. Her defeat, were it to happen, could kill Democrats’ hopes of retaking Congress’ upper house — Republicans now have a 51-49 seat advantage over Democrats. The two-term incumbent led her Republican contender, Hawley, in the polls by meager numbers during much of this year. The most recent polls, however, show Hawley with a lead. Hawley, too, knows what’s at stake in this election. Last week, in front of Air Force Two with Vice President Mike Pence, who flew into Springfield, Missouri, for a fundraiser in support of Hawley’s campaign, Hawley said the agenda of the administration could rest on the shoulders of Missouri voters. To win, McCaskill must try to woo Trump voters who have not been impressed by the president’s policies or political decorum, and she must also find a way to appeal to black voters — such as the tens of thousands in and around St. Louis — whom the Democratic National Committee is targeting with large amounts of money to hire community organizers to motivate groups not inclined to vote in midterms. McCaskill’s task will not be easy. Evidence of her attempting to appeal to dual constituencies came, for example, in her expression of sympathy for Trump supporters in Missouri. Hillary Clinton lost Missouri — and McCaskill said there were a lot of reasons why Missouri voters chose Trump, and she understood why. Black voters in Missouri, who overwhelming vote for Democrats, aren’t likely to back Hawley in significant numbers. But they might stay home, too — something that could harm McCaskill. Nationally, black voter turnout in presidential elections dropped from 66.6 percent in 2012 to 59.6 percent in 2016, according to the Pew Research Center. Democrats — using Trump as a foil — are attempting to convince black voters that sitting out the 2018 midterm elections is not an option. In August, the NAACP released results of a survey it conducted among voters in competitive house districts across the country. According to the results, 82 percent of black voters felt disrespected by something Trump said or did and 79 percent said he’s increasing racial divisions. Black participants in the survey were not quite as certain they’d vote as whites said they were, but a majority intended to cast a vote for a Democrat. McCaskill could reap the benefits of a black backlash against Trump. She could also benefit from an organization called Missouri Black Votes registering more than 87,000 mostly black residents across the state. The group is affiliated with and partly funded by BlackPAC, a super PAC credited with heavily influencing black voter participation in Alabama’s 2017 U.S. Senate special election. In that red state contest, Democrat Doug Jones narrowly defeated Republican Roy Moore. BlackPAC has recently injected cash in Missouri’s U.S. Senate race, spending $23,630 on radio and media production costs in support of McCaskill, according to a recent filing with the Federal Election Commission. Frazier will also help McCaskill by deploying 40 of the 56 St. Louis City Democratic Committee members to knock on every single door in the city by the end of the month to explain the importance of McCaskill’s re-election. She’d like to reach frequent voters and those who don’t normally vote in congressional races as Hawley is a threat to health insurance protections and he would likely vote with Trump, she said. Trump, who trekked to Springfield, Missouri, last month in support of Hawley, boasted of Hawley’s stances on crime and the Second Amendment. Hawley, however, hasn’t spoken much about his stances on housing outside of his lawsuit against the St. Louis Housing Authority as the state’s attorney general. It’s all a political ploy for election, Frazier said. “He doesn't give a darn about Peabody and the people that's in Peabody,” she said. However, Williams, a Clinton-Peabody resident who normally votes for Democrats, will consider Hawley once she does more research, she said. McCaskill has her vote for now. For people who aren’t excited about either McCaskill or Hawley, they can choose among Libertarian Japheth Campbell, independent Craig O’Dear and Green Party candidate Jo Crain. Deborah Madison, a 64-year-old daycare worker, expressed displeasure with both Clay and McCaskill although she voted for them out of habit in the August primary, she said. The grandmother of 26 said she saw Clay at a neighborhood meeting in August, but she left unimpressed because of his evasive answers to questions others had asked him. 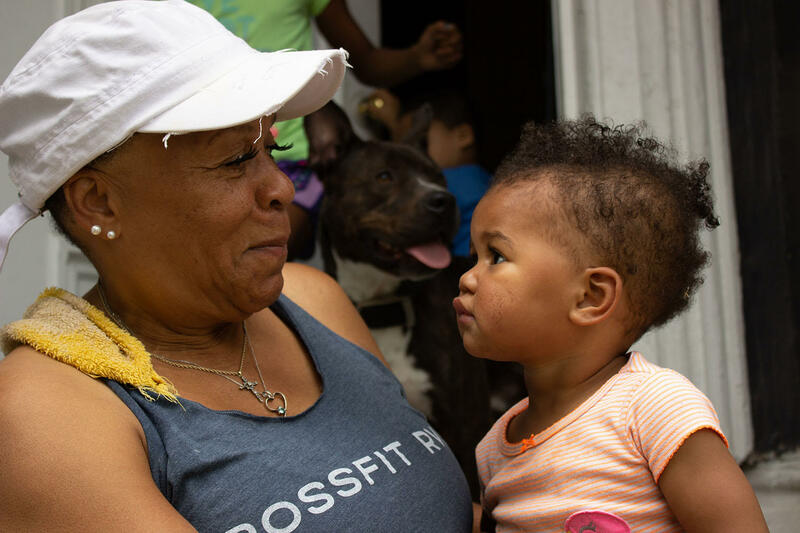 Madison in front of her daughter's home with her grandchildren and their family pet in July. Madison now wants to research “the Republican that’s running” — Hawley — before making her decision that will be heavily informed by The St. Louis American, a weekly newspaper that serves African Americans in the St. Louis area. While her Fairgrounds neighborhood was decorated this summer in Clay signs with speckles of McCaskill in between, volunteers from either campaign have yet to knock on her door. Joe Hodes, chairman for the St. Louis City Republican Central Committee, said Democrats have become complacent and have taken voters like Madison for granted. Hodes, a third-generation Republican, said Hawley wants to listen to distressed communities and figure out solutions. Visiting black clergy earlier this year without publicizing it is an example of Hawley’s ability to hear what communities want, Hodes said. Store clerk Carlos Hadad sees hardworking people in the customers he services at Gus’s Market Inc. in the northside neighborhood of Hyde Park. The 43-year-old Iraqi immigrant said he last voted for Obama, but he doesn’t pay attention to the news anymore because he thinks Trump is a racist who’s dividing the nation, and that reminds him of politicians in Iraq. 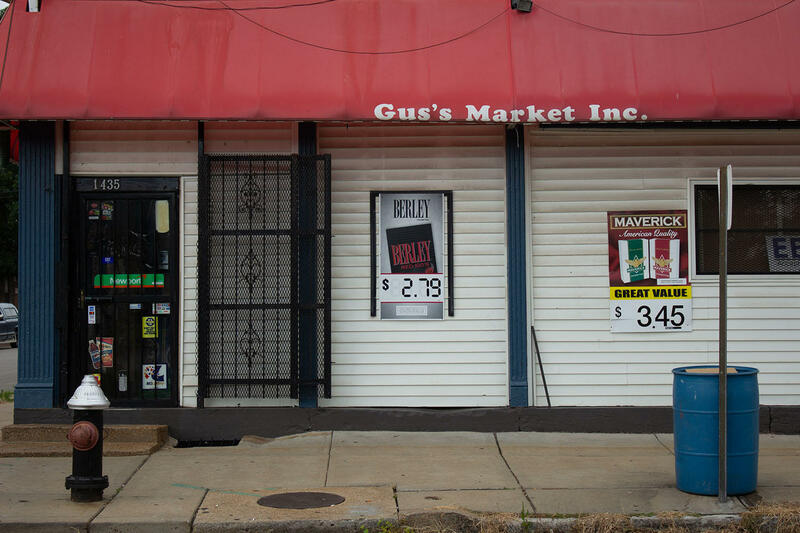 Outside of Gus's Market, Inc.
Hadad said drugs have plagued the Hyde Park community for a long time, but the area is getting better even though people there still struggle. Right across the street from the corner store, new homes were being built. He keeps a composition book of handwritten tabs for his customers who find it hard to pay him when it gets close to the end of the month. Some of the charges are for a bag of chips or canned pasta. Hawley has painted McCaskill as part of the wealthy, liberal elite who flies across the state and is removed from what voters in Missouri want. The ZIP code area including Hyde Park and Fairgrounds had some of the lowest levels of federal campaign contributions to candidates or political committees during the last presidential election, according to the Center’s analysis of campaign finance data. Disregarding most contributions under $200 — the threshold for identifying where a donation originates — the average contribution per person was 12 cents, according to data. The ZIP code with the lowest overall contribution was Walnut Park East, located in the north side of the city, with only eight contributions, which averaged to one penny per person. Overall, though, the City and County of St. Louis had higher levels of political giving than most of the country, with averages, respectively, of $15.83 and $23.99 per person. City of St. Louis voter turnout in the 2016 presidential election was also slightly lower than the state average of 66.56 percent. Madison has never given money politically but she wonders how differently issues in her community would be handled. “If we poor people had the right amount of money to help them and they could see that we were giving our last, [politicians] would be doing something,” she said. Madison sitting in front of her daughter's house, watching her grandson play. The median income, voter turnout from the last presidential election and the amount of campaign contributions from same timeframe are higher in St. Louis County compared to the city. As for Harris, living in St. Louis isn’t getting easier. She said she’s not getting the full $350 in child support a court has ordered her daughter’s father to pay. She’s given up on buying more furniture in case another leak in her home drips onto her sofa. She wants to pay her rent, water, trash and her ADT security system subscription, which helps her sleep at night, without needing to ask her family members for help. She hopes elected leaders come up with a new plan to help people like her transition off the system, but she’s unsure how much faith she actually has in any party to protect people like her. Michael and Danielle Abril are active members of the Meacham Park Neighborhood Association. They show up at meetings. They volunteer. They help inform others in the community. “Meacham Park is a blessing to us because it allowed us to be relatively close to my work and in a great place, a great community,” Michael Abril said. The neighborhood is a mostly black area of Kirkwood that had been segregated from the rest of the city for years. But that’s changing. Updated June 20 at 4:30 p.m. with additional comments from County Executive Steve Stenger and a local housing expert. - A key recommendation from the St. Louis Fair Housing Conference in April is prompting action in St. Louis County. The county has assembled a task force to develop recommendations for promoting housing "equity, fairness and inclusion in our region," St. Louis County Executive Steve Stenger announced at a news conference Wednesday morning.